The island nation of Sri Lanka is indeed a popular tourist destination in the World and is one of the finest in the Asian Sub continent. Throughout history, this land of eternal charm has been of great interest to Tradesmen, Conquerors, Colonists, and Honeymooners, globetrotters, Historians, writers and even culinary artists. This paradise nation is filled with natural wonders, scintillating beaches, wild life, proud heritage, grand history, mouth watering ancient cuisine and is world renowned for its warm and friendly locals. The total population of Sri Lanka (formerly the British Ceylon) numbers just more than twenty million, but its cultural diversity which is rich and vibrant has helped weave Sri Lanka’s very own multi cultural mosaic. But for over many centuries other prominent Ethnic groups such as Sinhalese and Tamils who claim to be the earliest known inhabitants of the nation have fortunately received greater focus and attention both at home and in the International forum. Thus the ignorance and oversight has simply paved the way for the extinction of many distinct Ethnic minorities in the country. It is pity to note that local minorities like Parsees, Bharadhas, Portuguese/ Dutch Burgers and Khojas are on the verge of extinction. Following the Independence of this island nation in 1948, repatriation came into effect and it eventually led many communities who had settled down during the Colonial days to relocate themselves back to their native lands. Among those who migrated, Afghans better known as “Pathans” the well known money lenders of Sri Lanka were also persuaded to leave behind their assets so to return back to the land of their ancestors, the present day Afghanistan and Pakistan but reports claim that many chose to remain in Sri Lanka and later migrated to India. Thus the Afghans, who are known to have struck terror in the hearts of the local populace in the bygone days of British Ceylon (former name for Sri Lanka) eventually moved out and since then they remain to be lost memoirs in the history of the nation. Through the passage time, their petrifying image has been slowly and cleverly removed from the minds of the present generation Sri Lankans who are certainly unaware of their advent, settlement and of their deportation. But the Afghans were once an integral segment of Sri Lanka and true adherents of Islam faith whose history in Ceylon is largely unknown. The Afghans of British Ceylon are remembered to this day by the surviving old folks who hail from Slave Island, a highly commercialised region of the Country’s Capital as “Pathans”, a term that is of Urdu origin, the language which is still used as the mother tongue of the local Memons and Borah communities. 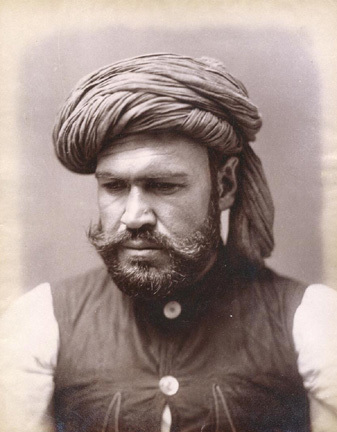 The Afghan’s were known by the Sri Lankan Malays as “Afghan Orang/ Kabul Orang” (meaning men from Kabul/ Afghan man) and as “Kabulmanishen / Bengalimanishen”(meaning Afghan/ Kabul/ Bengali man) by the local Moors. The Pathans/ Afghans belong to an IndoEuropean ethnicity that are characterised for their communal conduct, vibrant Culture, language, ethnic diversity and their rich and proud heritage. 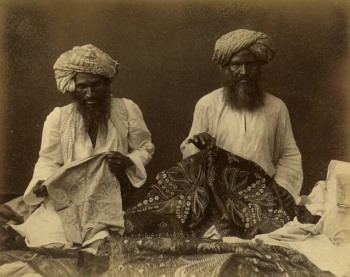 But throughout their stay in Ceylon they were renowned for their unique and vibrant Pushtuni fashion attire. The normal attire of the Tall, and muscular Afghan man who usually wore a beard and a moustache included a loose upper tunic which resembles the present day kameez or the Indian Kurta while their lower garment was Partugs fashioned with intricate pleats. But their raiment’s were always spotlessly clean. Their robust image was embellished with elaborately embroidered waistcoats (usually black, rarely green/ multi coloured) with buttons and crimson silk cummerbunds which carried daggers and miniature grooming kits. The common headgear of the Afghans was the elevated white cap in a shape of a cone around which the long shawl was tightly wrapped to make their turban. It is said that two long green and yellow shawls were twisted to form a cross pattern which was then wrapped perfectly to form their charismatic turban that looks very similar to the ones worn by Rajasthan male folk. But some Afghans chose the dual coloured turban to be worn primarily on special occasions and wore either a simple white or green turban where the shawl’s tail piece was left to fall over a shoulder.